Most of the major cities have more than one good-sized airport that we tend to forget about while booking flights by searching only on one specific airport. This can make travelers miss out on the better deals to the destinations and also provides fewer opportunities to explore the cheapest of flight fares. Also searching for the alternate airport can be beneficial for passengers trying to look for a location close by that or away from the popular tourist crowd. A classic example of this is Gatwick and Heathrow, both of which are grand international airports close to London and is well connected to the British; Capital. But among tourists Heathrow is more popular than the former. A survey conducted had found that travel websites tend to spike the ticket fares based on the number of times the website was visited by a single IP address or if a specific choice has been saved in the Browser history. Although we usually tend to forget this and fail to realize the sudden price hike in times of peak season and last minute rush hour, clearing out browser history and cookies can help. 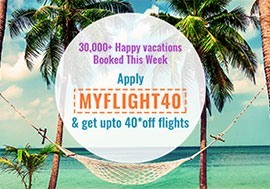 This not helps you to save more on flight deals but also prevents cluttering up your system with too many online cookies, advertisements and pop ups. The most advisable cheap flight fare hack is to book flights for weekdays when the fare is comparatively low than the Weekends. And although Friday may seem as the most favorable day to plan your trip followed by the weekends, it is always prudent not to book a flight on Friday Saturday or Sunday as the fares are always higher. These three days are the priciest days in travel bookings and fares can go high up to a ridiculous amount based on demand. Also festivals and events like New Year’s Day, Christmas, Easter’s or even Summer Vacations are time zones when the flight fares for certain destinations go up higher based on demand. Often in our haste to make cheap flight reservations we tend to neglect hidden costs that get added to the flight fare when we make the final payment or at a later stage. This may include situations when a travel website shows a very cheap flight fare and we miss to notice that it is only hand baggage fare. Including this there are also choices of class and inflight service that is provided by various airlines and which are imperative to be taken note of prior to making flight booking. Other hidden costs that travelers may ignore are service tax, transaction costs, added inflight meal charges, extra baggage charges and others.